Cape Town - South Africa's Dyan Buis has won a silver medal in the men's 200m T38 final at the London Paralympics on Saturday. Buis came second in a regional record time of 22.51 seconds. The 21-year-old now boasts three medals at this year's Games, after earlier winning bronze in the men's long jump F37/38 and silver in the men's 100m T38. Australia's Evan O'Hanlon won gold, setting the new world record of 21.82 seconds, while China's Wenjun Zhou took bronze in 22.65. 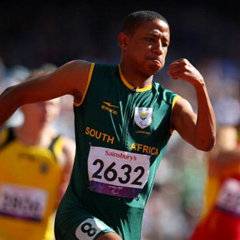 The other South African taking part in the race, Union Sekailwe, ran a personal best of 23.66 to finish sixth. Team South Africa is currently 18th on the medals table with 25 (6 gold, 10 silver, 9 bronze).